Selling any product or service in a technology-based platform has it’s own unique challenges, and can be an overwhelming experience. DB offers Woocommerce as a professional online ecommerce solution to make this process painless and seamless. Make your website a powerful selling tool today! If you are a small to mid-size company and looking to sell goods and services online, WooCommerce is the platform perfect for your business. WooCommerce is a merchant platform that is quickly become a leader in usability, performance, and functionality of ecommerce storefronts. Powering over 30% of all online stores (more than any other platform) worldwide. This ever-growing platform provides users extensive features, a user-friendly interface, and a maintenance and operation cost to operate are much less in comparison with the larger platforms. These storefronts can vary from simple pages where products and services are clickable to full-integrations that include online with payment processing services, credit card and provide transactional details. DB experts will tailor your WooCommerce ecommerce component seamlessly to your Responsive WordPress Website, making your storefront viewable on all devices, smartphones, tablets and desktops. Giving you more accessibility to your reach more potential clients through many digital streams. Flexibility – A benefit to ecommerce newcomers is that merchants using the platform will be amazed by the amount of flexibility with their products, without having to know technical jargon. Products can be categorized, given sale prices, independent attributes, and more. Integration – A fully functioning store can be placed within your professional website. Get an online presence all in one place that is presented together seamlessly within a WordPress based platform. This saves time and money, while reducing confusion and build times. Customization – WooCommerce allows you to customize and tweak your online store to your unique style and taste. Making your store match your website colors and type fonts, which further connects your brand. Professional – Expert tools such as detailed order tracking and customer engagement tools allow merchants to view past and open orders, update delivery status, apply discounts and so on. You can also setup tax settings, inventory management, shipping options, coupon codes and many other options for your professional ecommerce storefront. Analytics – WooCommerce provides analytics within the system to track statistics and allow merchants to view progress and trends occurring in the store. Figures like total sales, sales by date, average order totals, individual customer statistics are all presented in easily readable graphs, without the user ever having to leave their admin panel. Growth – Woocommerce also allows you to grow and expand in terms of how you manage your store, products and customers. It’s easy to modify templates, use various APIs for building extensions, access an extensive documentation library, so you can learn the program inside and out. They also offer many Apps relating to accounting, payment gateways, marketing, reporting and more. 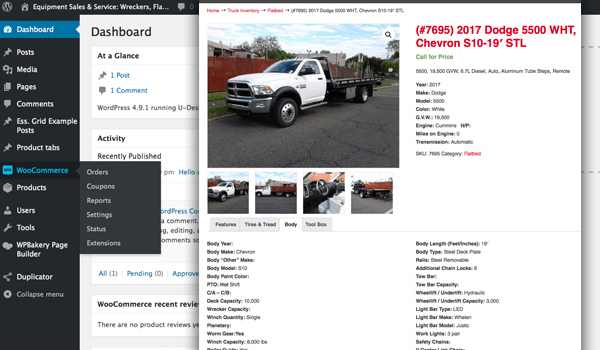 Product pages – provide multiple views and levels of product specifications, along with dynamic pricing capabilities and quantity adjustments. Shopping cart – a page that contains all of the items added during the shopping session. Users can update quantities or delete items. Checkout page – where users can provide payment information and submit an order for fulfillment. Account pages – the ability for a customer to set up an account, view orders, and manage contact, delivery and payment information. Payment integration – the ability to accept and process credit card data, or integrate with a system like PayPal, that provides that service. Take your buisness to the next level by integrating your website with WooCommerce, for selling of your products and service online. Call today to find out how.